Compliance with industry regulations is no longer a check-in-the-box exercise. Organizations are working to embed policy compliance into processes and frameworks to protect themselves not just from penalties, but also from cyber threats. 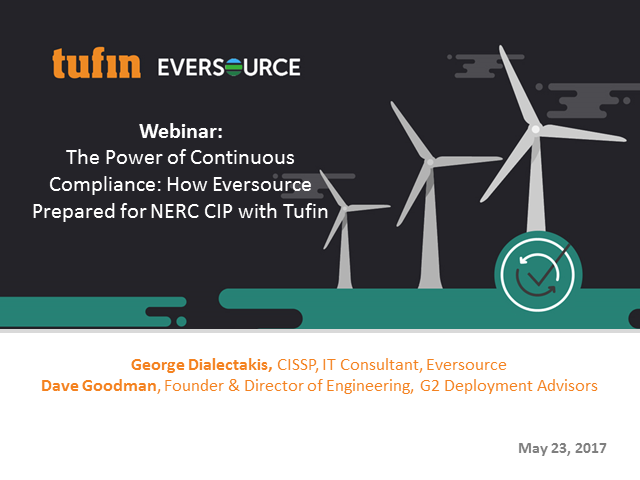 Join this Webinar to learn how Eversource, the largest energy delivery company in New England, is using Tufin to achieve continuous compliance with NERC CIP, and how you can ensure regulatory compliance, relieve audit preparation, and increase productivity. Don't miss the expert guidance from G2 Deployment Advisors on how dynamic, customizable process automation can ensure continuous compliance with corporate policies and industry regulations.